Da Nang is now an attractive tourist destination in Vietnam, which means that the number of visitors come to Da Nang airport is growing. 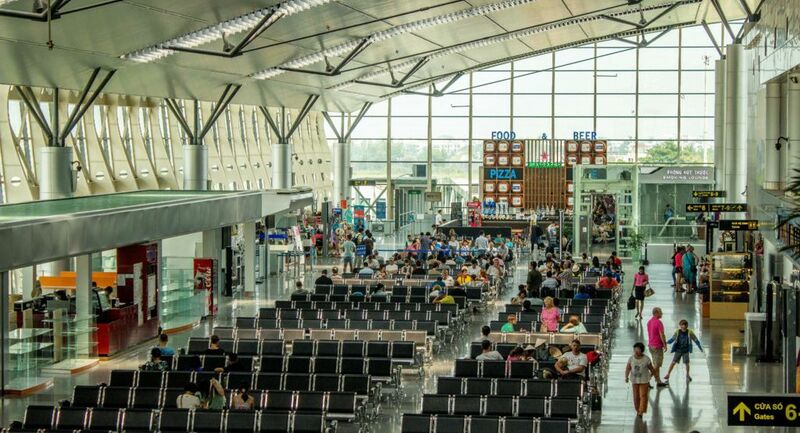 This article, DichungTaxi will provide you the latest information about Da Nang airport, station location, waiting room and other facilities. Da Nang International Airport is the largest airport in Central Vietnam. 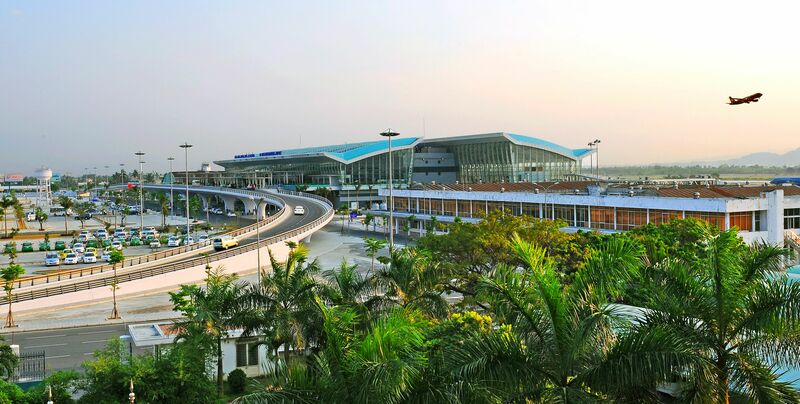 This is the third largest airport in Vietnam after Tan Son Nhat International Airport and Noi Bai International Airport. Da Nang International Airport was built in 1940. Currently, there are 4 domestic airlines and 22 international airlines are operating flights to Da Nang International Airport. In 2015, Da Nang International Airport ranked 23rd in the top 30 best airports in Asia, according to The Guide to Sleeping in Airports . Da Nang International Airport is located in Duy Tan, Hoa Thuan Tay, Hai Chau District, Da Nang; about 3 km from Danang city center. 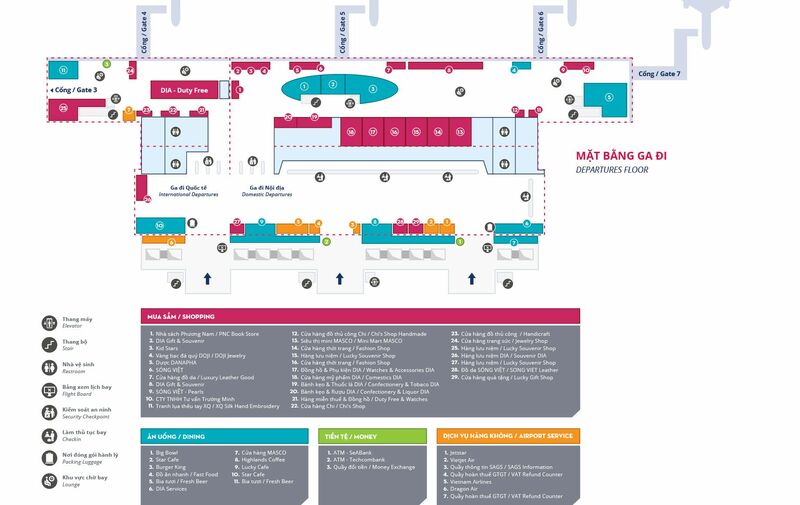 Da Nang Airport has two passenger station including: National Passenger Terminal (T1) with an area of ​​nearly 14,500 m2, including 3 floors and a basement with a total floor area of ​​36,600 m2; and the International Terminal (T2) is built on 210,000 square meters of land, designed to be two separate highways. Da Nang International Airport currently has two takeoff and landing lane (3,500m and 3,048m), equipped with signal lights on the taxiway, runway, appron (parking lot) ..., the system Accurate navigation and landing aid (ILS, VOR / DME, NDB), advanced primary - secondary radar systems, advanced meteorological observation and forecasting systems, Modern apron systems ... capable of serving large commercial aircraft such as Boeing 747, Boeing 777, Airbus A340, ... take off and landing in all weather conditions. - International flight: 03 hours before the scheduled departure time. - Domestic flight: 02 hours before the scheduled departure time. - International flight: 50 minutes before scheduled departure time. - Domestic flights: 40 minutes before the scheduled departure time. When you check in at the airport, to keep your luggage safe, you can cover your luggage back with plastic bags. Remember to do this before before weighing your luggage, because the suitcase will be sent out always. Although they arrive at the airport, they give us a piece of paper to address and telephone contact to avoid losing things, but we should also pre-write and paste on the suitcase at home. Include your name, home address, if you are an international student, include your school name, school address, school phone number, current home address and e-mail address. Once prepared, you should be in the waiting room about 40 minutes for sure. Airport taxi is the fastest and most suitable way to travel to Da Nang. With a distance of only 3 km, take a taxi from the airport to the center only takes about 5-10 minutes, depending on the time and traffic condition. Taxis from Da Nang Airport to the city about 60,000-100,000VND not much difference between companies. Da Nang has long been known for its friendly motor-taxi model. The motorbikes here are fully equipped with uniforms, helmets, staff cards and service civilized style, courtesy. Not only that, the price are also listed on the windscreen and service rates are automatically calculated by the meter on the car. Guests can refer to the following two friendly motorcycle taxi numbers: 0511.2.81.8888 or 01235.43.43.43. 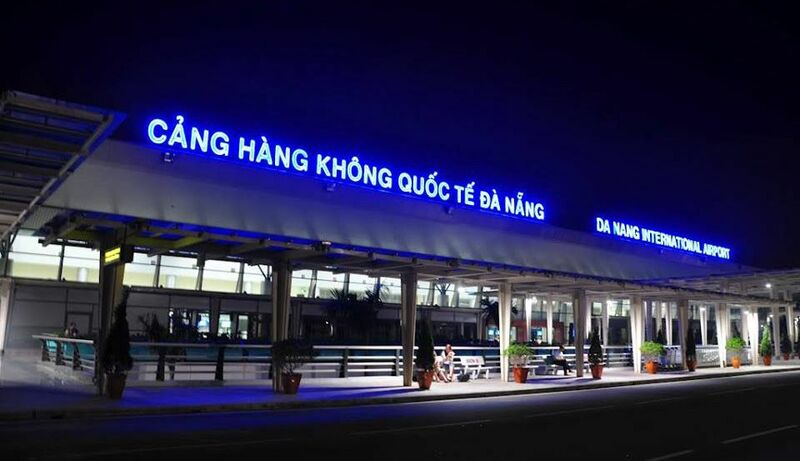 Da Nang airport car rental company - Son Tra: 0977.000.744 Add: 92/19 Thi Sach, 100m from Da Nang airport. Get 1 liter of gasoline and 2 raincoats, you can pick up the car right at the airport or to the shop to pick up the car, very close. Hai Van airport car rental service: 0981.228.227 Address: Man Thien airport 500m. Give 1 liter of gasoline, guide enthusiastic guests, delivery at the airport, you can also walk to the store but a bit far. Car rental company Anh Tuan 0974.616.556 Address: 141/16 Tieu La is one kilometer from Danang airport, the biggest and oldest motorbike rental place, car rental with prestige and quality. Cyclo is also a means of transportation from Da Nang Airport to the center, suitable for travelers less luggage and want to explore the city of Da Nang or Hoi An ancient town. The advantage of this transportation is that the price is relatively cheap and convenient. The rent is about 50,000 VND / hour. However, you have to leave the airport terminal to rent because cyclo are not allowed in this area. Waiting area of 3,500 m2. Here, passengers have free access to drinking water and Wi-Fi. In addition, passengers can watch TV, read the newspaper for free. Recognizing and understanding the increasing demand of passengers for the first time in the plane or guests need special assistance, many units exploit services at Da Nang airport has launched a new service dedicated For passengers traveling by plane named "Passenger Assistance Service" with the desire to bring the optimal utility for passengers. Services at Da Nang airport will help check in tickets - luggage before the flight for passengers. Customers will not have to wait in line to check in. In addition, with some types of tickets, guests will be selected on board the aircraft as required such as the upper seat, seat by the window, seating near the aisles, seat with the accompanying delegation. 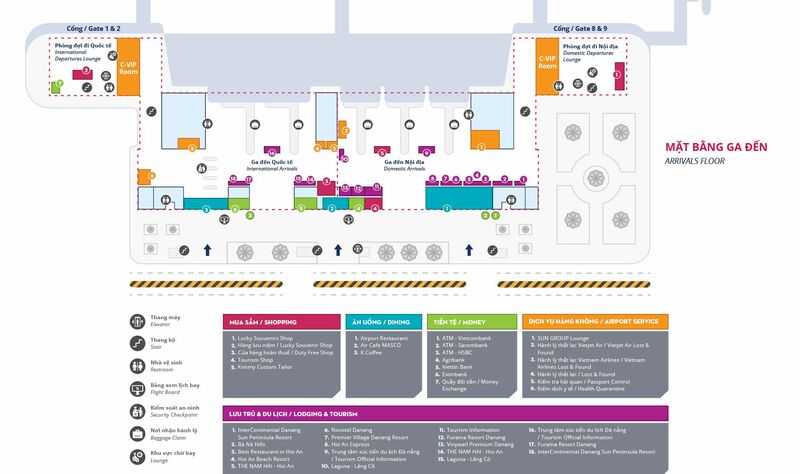 This service also assists passengers to complete their Customs, Exit and Security procedures on boarding lounges. Applying visa - services at Da Nang airport will advise clients on the form of visa entry at the border for customers to know the details; To complete the dossier and represent the client in completing the procedures for applying for the entry visa to the foreigner at the border gate; Receive the official letter of entry permit from the Immigration Department; To guide clients in entry procedures into Vietnam upon arrival at the airport, procedures for writing declarations, guiding the payment of fees. At present, at Da Nang airport, many cafes and restaurants, can serve the needs of visitors. In addition, passengers who wish to rest for the flight, or to leave after the flight, can look to airport service providers to meet the need of rest at the 1st floor of the airport. Lodging system, hotel pretty much and near the airport. Many foreign tourists traveling to Da Nang and other provinces in the Central area need to exchange money or foreign travelers who wish to exchange money at banks located at the 1st floor of the airport. Automatic machines are also located in the Da Nang Airport services system. The hotel is located in the city center, near the bus station, airport and train station. It is conveniently located to the tourist attractions such as Han River, Bien, Ba Na Hill ... The hotel is an ideal destination for visitors to stay when visiting. working in Danang. The best 4-star Samdi hotel is just 5 minutes from the international airport and 10 minutes from Da Nang beach. Moreover, the administrative areas, shopping, entertainment are also within 5km radius, very convenient for guests to work and travel Da Nang. Moonlight Hotel - 3 star hotel Danang, built in French style, luxurious and modern, 3 star international standard. With 90 rooms, fully equipped with top quality service. In addition, the hotel also offers conference rooms with capacity of 150 - 200 guests, coffee - Moonlight luxury bar located on the 17th floor is an excellent choice for panoramic view of Da Nang city from above. This hotel is 2 km from Da Nang Airport. If you have found a hotel, then book a taxi to get there right away with DichungTaxi's cheap taxi service, you will save 40% compared to regular taxi prices. With the above information, Taxi Coupon hope you have found the information necessary for you. And do not forget that Taxi ride is available any time you want to move from Danang airport by taxi! See you on upcoming trips!